One thing about my mom is that she was so much fun to be around and, when you were with her, she made it seem that you were the only one in the world. It was always like that for her… she was where the action was and right in the center. Curiosity and a burning desire to excel provided her with the most diverse life-long resume. Artist Barbara Matteo-Serbent doing what she loves best. She was born in the great plains of North Dakota back when William Howard Taft was president and where, over the next thirty years, she developed her skills in poetry, farming, dancing, cooking, hunting and fishing; it was where she learned to love books; and where she married and began a family. My mom’s vision and desire to move to California came when she and Alton participated in defense work there during World War II. That experience convinced her to make a permanent move to a wondrous ranch in Fair Oaks where she developed a nursery for African Violets. One of her own violet strains she called “San Juan” after the name of our street. There she raised every kind and variety of animal and bird, along with verdant fruit and nut orchards and lush floral as well as life-sustaining truck gardens. She collected, refinished and traded in antique furniture and became one of the area’s most celebrated antique bottle experts. It was here that she began a long, successful career as a painter after a period of intense study with nationally known artists. She loved her adopted state and managed to travel and camp over every foot of it – savoring its mountains, valleys, long coastline and sparkling rivers all captured in watercolor. After our dad passed away in 1964 Rene remarried and made her second big move – this time to Sedona, Arizona – where for the next twenty-one years she enlarged her scope of interests to include an intense acquaintance with the American Indian and a consuming passion for birding. 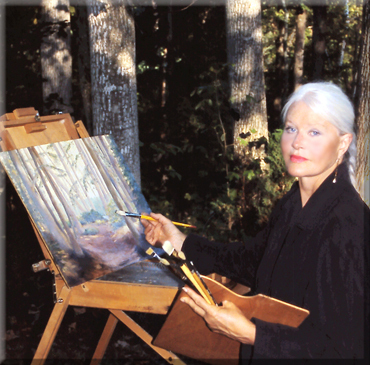 Here her painting career reached its zenith resulting in soaring sales and modest fame. Although they remained married for the rest of their lives, George and Rene separated after two decades and mom went on to enjoy years of travel to Australia, Mexico, Central America, Europe and every American state. Rene made her third and final move to Texas in 1991 to be near her beloved son and daughter-in-law. There she focused her enthusiasm on the Church and the solace and deep friendships she found there. As her eyesight, hearing and ability to move easily disappeared she had to leave her wide-ranging activities behind but she retained all her knowledge and maintained vital interests in them, becoming a mentor to others intent on education. Her collecting urge never left her and she become known as the Teddy Bear Lady, complete with calling card, who took great pleasure in presenting hundreds of these soft little bears as gifts to local children. Her gifts were many and her legacy rock solid. She taught us how to respect and love nature, how to live life to the fullest with curiosity and grit, how to recognize our own needs, how to find and fully express our creativity, how to genuinely befriend and love our neighbor, how to age gracefully and with dignity, how to gently leave this world totally prepared, and how to find the spirit of God within ourselves and in the natural riches of the planet we live on. She taught us by example the concepts of honor, compassion and ethical behavior in daily life. And she will always live in the astounding heritage she left us. There is a saying that goes…”when you look back on your life one hundred years from now, no achievement or material gain will matter at all except the fact that you were important in the life of a child.” Believe me, she was not only essential in my life and the lives of her other children, but also in the lives of her natal family and in the thousands of friendships she nourished over her long richly interesting life. My name is Barbara Matteo-Serbent of Castleton, VA and Monterey, CA, and my mother’s name is Rene Willis Knapp Larue of Tolna, ND, Fair Oaks, CA, Sedona, AZ, and Seguin, TX. This entry was posted in Daughter, Inspirational, Mother, Wife, Women and tagged artist, Barbara Matteo-Serbent, friend, Grandmother, herstory, inspiration, Inspired by my mom, inspiring story, Mentor, Mother, motivational, Second World War, tribute, United States, wife, Woman. Bookmark the permalink.